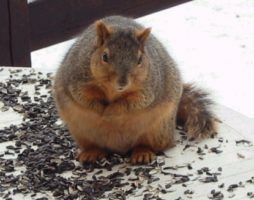 “Me too, buddy,” muttered Northwestern freshman Jillian Peterson upon noticing and deeply relating to a nearby fat, distraught squirrel. With the onslaught of freezing temperatures lately the panic-stricken rodent was ferociously searching for a place to sleep during these harsh winter months. “I’ve gained the freshman 15. I can’t find the new buildings for my winter quarter classes. All I truly want to do is nap. For all intents and purposes, that squirrel right there is me.” Reported Peterson, locking eyes with the squirrel, who was attempting – but failing – to climb up a tree. “Such heights feel unreachable, don’t they, little guy?” She said, staring vacantly at the dead branches above both her and the squirrel. As she thoughtfully watched the distressed creature hop in and out of several sad-looking bushes, Peterson sighed and smiled. “Hopefully we’ll come out of this quarter stronger, huh? And more well rested.” The squirrel then scampered off into the distance, to which Peterson replied, “Are you late for class too? Hey, where’s Lutkin?” She asked, retrieving a package of almonds from her coat pocket and began anxiously speed-walking away.